This is our 4th year of keeping bees at the property. We just this year have started to be able to harvest some honey. I read numerous wonderful books about beekeeping – but have found that I needed lots of hands-on experience to start to understand my hives. 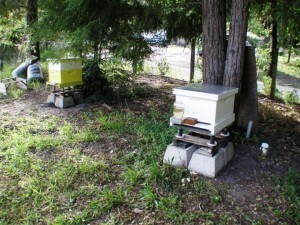 This spring (2014) I was able to keep two of three hives in healthy condition. We lost one hive to honey robbing when I did not watch it carefully enough during the winter. 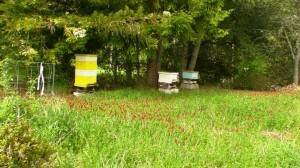 This year I will try and split the two hives into four. We seem to need more forage for the bees – especially in the late summer and early fall. I have planted clover for them – but need to get in some other plants that will give better late season nectar. We have a very strong deer presence that viciously attack any new plants we plant. We hope to get a perimeter deer fence up this year. I put my hives up on blocks with water cups under the hive supports to help with ant control. 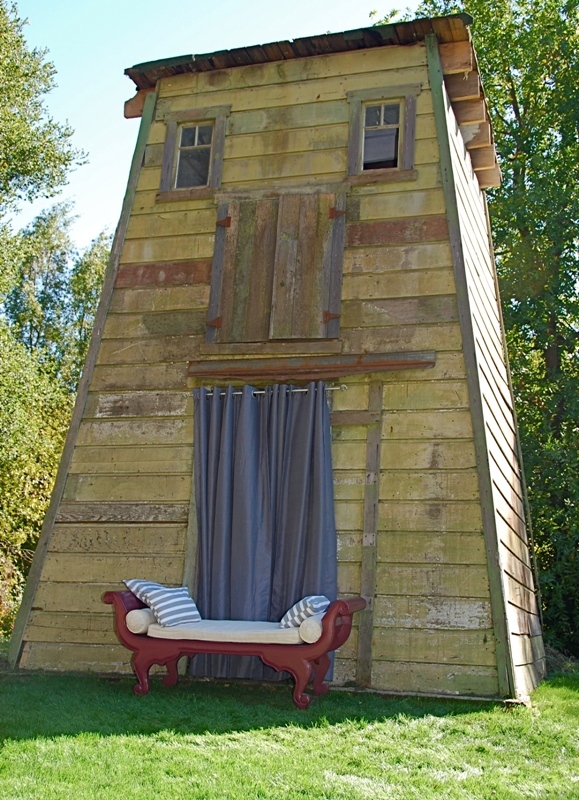 I have them facing south under some redwood trees for winter sun and summer shade – well away from the wedding venue area. I cut out the bottoms and put in 1/8 inch screens for better ventilation. I have been lucky with the Italian Queens as far as temperament. I have only been stung once when I was moving too aggressively with a disrupted hive. I can now open the tops to feed them and do other chores without using protective equipment. I still need a vail when I remove the foundations for inspection – but am OK with bare arms. No one else has ever been stung as the bees are located north of our orchard away from most of our human activity. Joscelyn, Thanks for letting me know about your website. What a wonderful and idyllic place. I will definitely spread the word. Now you need to set up a Facebook page so all of us can “Like” your page.